I love lagers. You unfortunately don't hear that enough out of the mouths of beer geeks, but I really love lagers. I've heard people say things like "I don't like lagers." I understand they might associate lagers with macro beer, but they are really cutting themselves off from some of the world's very best beer under that idea. Lagers can be anywhere from wonderfully easy-drinking pilsners to body-warming dopplebocks. One of my favorite types of lagers is the slightly obscure zwickelbier style. This isn't a very well known style here in the United States, but I certainly hope that will change. The zwickelbier (pronounced "zvick-el) is a very close cousin of the kellerbier (celler beer) style. They are both unfiltered, unpasteurized, yeasty, hoppy, malty lagers that hail from the Franconian area of Germany. They are still very popular summer biergarten beers. The main difference in the two beers is their mouthfeel and carbonation and on historical examples, the color. Kellerbiers were usually stronger in ABV and in hop levels. True kellerbiers would have been fermented "unbunged" so that the carbon dioxide escaped while maturing in a wooden cask. The final product would have had little to no head and really would have resembled British cask ale. That certainly isn't the case anymore, but that is historically accurate. Kellerbiers were normally brewed to between 5-5.5%ABV. This is a modern day "zwickel"
I had to tell you that part of the history to explain where the term zwickelbier comes from and why it is normally an obscure style here the United States. Zwickelbiers were the effervescent versions of kellerbiers. The zwickelbiers were fermented in sealed fermenters and served as soon as fermentation was complete. This created a more effervescent beer due to the carbonation. Zwickelbiers were normally brewed to a lower strength than kellerbiers, and normally didn't travel well. On-tap from the brewery used to be the only way you could get your hands on this style of beer. It is still the best way to experience the beer. 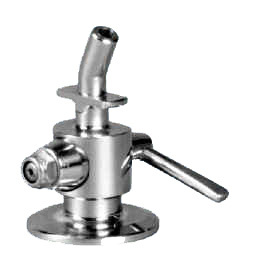 The term zwickelbier is derived from the word "zwickel," which was the sampling vessel on the outside of a fermenter to check the beer to see if it was ready to be served. I honestly don't know of any zwickelbiers that have been brewed in Indiana. My current favorite available here in Indiana is Zwickel from Urban Chestnut in St. Louis. With our history of German immigration here to Indiana and the references I can find to pre-prohibition beers in Indiana, we've had these beers here before. It would be nice to have the sunshine on my back, to be surrounded by good company, and to have another stein full of zwickelbier in front of me. November 3rd: TFN7: Weiner Time! Thanks to our handy number generator, we congratulate EHLOVader on winning the pair of tickets to tomorrow's Brew Bracket event. Have fun! -- Lennie’s hosted the 2012 Bloomington Brewing Company Homegrown Strong Ale release on Wednesday, September 26th, pub-side at 5pm. Each year the Bloomington Brewing Company crafts a special batch of beer from the hopvines at their Loesch Road farmstead, grown under organic principles. In May, Head Hop-Farmer and Brewer Floyd Rosenbaum trellises the vines on strings and cables attached to 15’ poles. Come about August 1st the hop cones are ready to harvest and brew into a delicious, one-of-a-kind ale. The 2012 installment of the Homegrown Series is a Strong Ale, light copper in color with a rich, malty sweetness and nice hop balance drawn exclusively from the local harvest of Cascade Hop cones. The Homegrown series is one of the favorites of the brewers and each year yields a beer chock full of personality. Available only at Lennie’s for a limited time. -- First Bottle -- Our first ever commercial bottle will be available for sale at Big Red Liquors (418 N.College location only) beginning Saturday October 6th. The beer is called B-Seven and is collaboration between Big Red, BBC using hand-picked Four Roses Bourbon Barrels to age our Blaze Bourbon Barrel Brown Ale. Only 450 hand numbered bottles will be available @ 12.99. Just a heads up that our website is now updated regularly with a current tap list. Here's where we're at at the moment. Our bottle list is also on our site - it's probably a little longer than it would make sense to share here, but it's definitely worth a look. 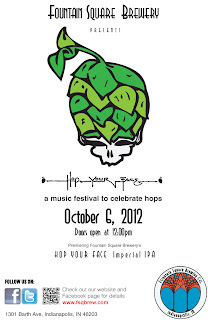 Put Oct. 6th on your calendar for the biggest party ever in Fountain Square. We will be tapping our “Hop Your Face” Imperial IPA along with showcasing 4 bands starting at 2pm. Our first “Hop Your Face”! This annual Imperial IPA is aggressively hopped with four different hops and loaded with a complex mix of malts. Might as Well add dry hops so over 2 pounds per barrel of hops were added to enhance the aroma. When Push Comes to Shove, this 9.5% brew may drive you to Hell in a Bucket, but at least you’ll enjoy the ride. 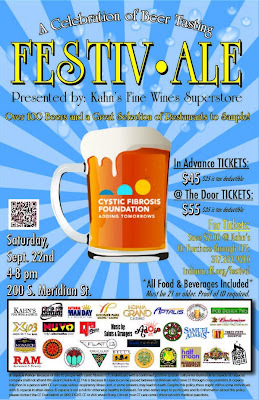 Triton at Noblesville Brewfest September 29, 4-8pm at Forest Park Shelter #5. Advanced tickets at Vintage Spirits, Noblesville, IN. Triton Brewing Company at the BrewBracket Tournament of Bourbon Barrel Aged Beers September 29, 6-9pm at Tomlinson Tap Room. Tickets are $45 from brewbracket.com. Tapping Fort Harrison Cherry Bourbon Barrel Stout, October 3, 5pm. This oatmeal stout spent the last five months in a bourbon barrel with 20 pounds of tart cherries and we can’t wait to share it with you! October 20, 5-9 pm Triton will be celebrating our first Anniversary. Join us for the release of new three new bottled beers, the official dedication of our Beer Garden, music, food and fun! See us on Facebook and Twitter for more info! Come meet Owner/Brewer Tom Schlafly and some of the Schlafly Team. The beers are aged in bourbon barrels from Harrison Bourbon. Indiana beers slowly soaking in the flavor of an Indiana bourbon. It doesn’t get any better than that. The style for the brewers is wide open for any beer they feel would be enhanced with a several month barrel soak. The event will be held at Tomlinson Tap on Saturday, September 29th, as an anchor to National Bourbon Heritage month. This event will run in a similar format to our standard tournaments. We’re featuring 8 brewers instead of the usual 16. We’ll actually be delivering the beer to the participants at their table and pouring it there, to keep a fun social element with the smaller crowd. Between rounds we’ll offer tastings of Harrison Bourbon to compliment the beers being tasted. Brew Bracket is the only one of its kind, a true tasting tournament for local craft beer. Participating brewers bring a similar style of beer for each event and are seeded randomly into a bracket. Participants blindly taste the beer 2 glasses at a time and vote for their favorites based on taste alone. Over the course of the day winning beers advance through the tournament until a “best beer” is selected at the end of the event. 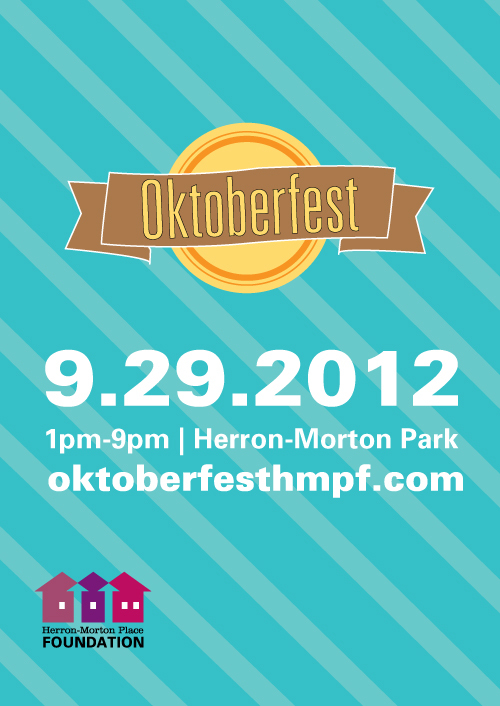 Herron-Morton Place Foundation is hosting it's second annual Oktoberfest on September 29, 2012. The event runs from 1pm-9pm at the Herron-Morton Park at 1927 Alabama Street. Advanced tickets can be purchased online for $5 or $10 on day of the event. Vendors include Flat12, Sunking, Upland, Fountain Square, New Day Meadery as well as Scratch Truck, Taco Lassi, 111 Cakery, Taste of Philly, Ivey Spice, Gypsy Truck, and JOAWS Brats. In addition, Indy t-shirts in both men's and women's sizes and pint glasses will be available for purchase. All ticket and merchandise proceeds go toward the Herron-Morton Park endowment. Lastly, don't miss the live music, featuring bands James and the Drifters, Tax Brandywine, Matthew Ferris Band, Vintage Union, Household Guns, Pravada, and Rugged Russian Bear. Saturday, October 6, 2012 | 4pm - When it stops! Bring your Lederhosen and St Pauli Girl outfits. Bring your crazy hats. Bring your kids and dogs. Bring your gramma even. It's a sure-fire fun for all, free for all! At Fauxtoberfest! we rock the house. We'll have a public, best-of-show style home brew competition, along with some samples of Tuxedo Park Brewers standards and seasonal kit favorites. Entertainment is still being worked out, but we're sure to have a smattering of live music, from bluegrass to rock and roll starting around 5pm. We hope to even bring on a comedian, some fire juggling, magic and much, much more! For those that stayed late last year, you remember: bring on your flippy cup game face. Pete from End of the Line Public House will be providing some great food, inspired by German and American heritage. It's sure to be a really good time! Purchase your commemorative glass now while they last! Home Brewers: Join the home brew competition, it's what the day is all about! Instructions: Bring three (3) gallons or more in a keg and show off your wonderful home brewed beer. Each participant will recieve $15 worth of Gift Certificates to the shop! 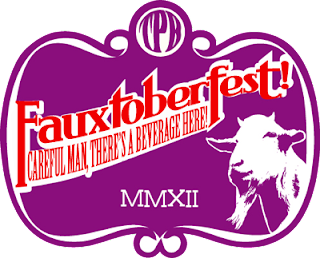 At the end of the night, we'll tally the best-of-show votes , and the top three home brewers will win some wonderful prizes from Tuxedo Park Brewers Supply. Please sign up by October 1, 2012 by emailing adam@tuxedoparkbrewers.com or giving us a call at (317) 408 - 6970. Custom limited edition glasses are on sale now for $25. Beer Tasting & Fundraiser, 2:00-3:00pm, Plainfield-Guilford Township Public Library, 1120 Stafford Road, Plainfield. Join us for an afternoon beer tasting fundraiser for the Plainfield-Guilford Township Public Library with Three Pints Brewpub and Black Swan Brewpub, sponsored by the Friends of the Library. Adults 21 years old and up are invited to learn more about beer and brewing. Afterwards participants will get to sample select beers from Three Pints Brew Pub. Registration is required. A $5.00 registration fee will be required at the door. All participants must bring a valid photo ID. For more information contact Joanna Carter at 839-6602 ext. 2159 or jcarter@plainfieldlibrary.net. Register is required for this event at www.plainfieldlibrary.net or by calling 838.3800. Thanks for the entries, this giveaway is now closed. Congratulations to EHLOVader for winning the tickets. This special event, held on Saturday (9/29/2012) is a departure from the previous Brew Bracket events. This one will be held at the Tomlinson Tap Room and will feature eight Indiana breweries that have placed a beer in a provided Harrison Bourbon Barrel for aging. Lucky attendees get to sort it out and pick a winner. The fine folks over at Brew Bracket have given us a pair of tickets to their SOLD OUT event. Lucky for you, we can't win. To enter, please leave a comment and tell us what you like to mix with Bourbon. We'll chose our favorite comment on Friday (9/28/2012) and announce it in the weekly Random Beer Roundup post. MAKE SURE YOU LEAVE US A METHOD TO CONTACT YOU - an email address or a twitter handle is just fine. You'll be responsible for checking back to see if you've won, and we can figure the rest out after that. Good Luck! Creative entries are particularly appreciated. We reserve the right to not give you tickets if we think you're shady. We reserve the right to change all the rules and not award the prize if we don't like how things go. By participating, entrants agree to be bound by these Official Rules and the decisions of HoosierBeerGeek.com, which shall be final and binding with regard to all matters relating to the contest. Not to long ago, this was a city that lacked beer destinations. Everyone had their own small collection of bars that could be relied upon to provide an interesting and diverse tap list, but there were few bars that called out to the discerning beer consumer. Then something changed. Craft beer became popular, local beer became popular. Seemingly overnight, Indianapolis became a beer destination. Now you can travel to the neighborhoods of Fountain Square, Mass Ave, Broad Ripple and Irvington with the knowledge that an excellent beer bar can be found. 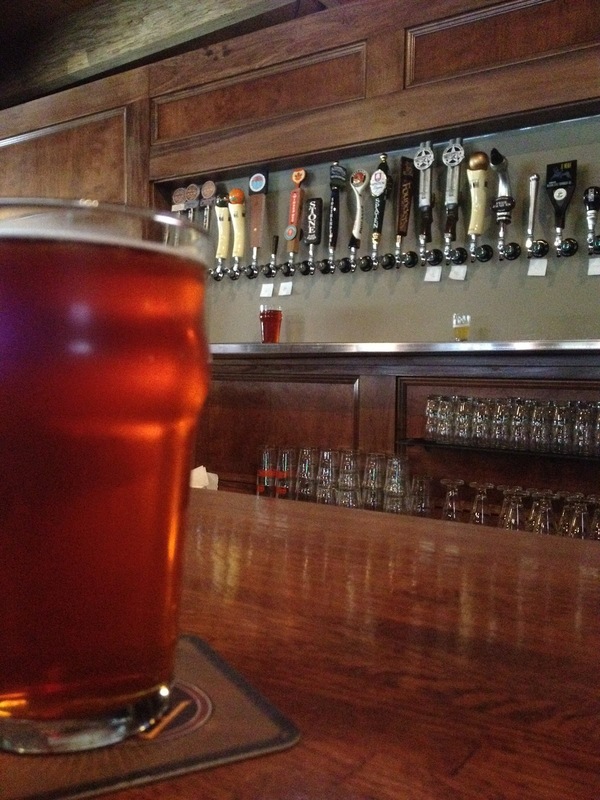 Enter Ralston's Draft House, the latest addition to Mass Ave's growing craft beer scene. Over the last year, there have been many rumors of what would be to come of the former Agio location. Despite the foot traffic on Mass Ave, empty commercial properties are always frightening. Each one signals the potential end of the rapid growth of our renewed interest in local business. Most rumors centered around Chatham Tap. Would Chatham Tap relocate to this location? Would they open an expansion? Now we have the answer, and it is a good one. Ralston's Draft House is now open for business. The former Agio space is a big one, and Ralston's is not exactly a hole-in-the-wall. Two separate dining areas plus a full patio provide ample seating for those seeking a quality pint. Ralston's features 24 taps, which are duplicated in each of the dining areas. The line up is well thought out, and follows the approach that I prefer - local, national and import craft is all treated equally. 6 Indiana taps are filled out by Sun King, 3 Floyds, Fountain Square and New Day. International representation comes from Spaten, Paulaner, Petrus and Guinness. Midwest, East Coast and West Coast were all represented. Beer aficionado favorites such as Schlafly Pumpkin Ale, Dark Horse Boffo Brown and Moylan's Hopsickle could all be found. Perhaps most notably, no Bud, Miller or Coors could be found on tap. Not even Blue Moon. I enjoyed an extremely fresh 3 Floyds Munsterfest. Drafts range from $5-7. A longer bottle list is available for those not satisfied by the draft list. Although beer remains the focus and the namesake of Ralston's Draft House, an interesting food menu accompanies the well thought out beer selection. Much as Chatham Tap's menu focuses around sandwiches that tend to break the mold of standard bar sandwiches, Ralston's menu has the feeling of a bar menu but focuses on unique offerings. Although I didn't try the food on this visit, I am excited to get back and sift through the diverse menu. Initial reports from friends are positive. It is certainly pleasing to see each of the menu items paired with a beer style. The decor focuses on wood paneling and a very comforting upscale pub feel. A street-facing bar has been added to the outdoor seating, which will be a prime venue on First Fridays for people watching. Inside, the bar wraps around the wall, providing ample bar seating with good views of the few but well positioned televisions for sporting events. There appeared to be multiple variations of beer glassware, which is always a plus. It's certainly an understatement to say that this is Mass Ave's first beer bar. MacNivens and Mass Ave Pub's draft line expansions this year are evidence that the Avenue is asking for more beer options. Anyone who has spent a Friday or Saturday evening on Mass Ave is familiar with how quickly beer-focused locations fill up, so Ralston's will be a welcome addition. It appears that while craft beer bars were once a financial risk, they now represent an arms race between neighborhoods. Who will end up with the most beer bars? Ralston's Draft House is now one more entry in to Mass Ave's growing list of beer bars. Anyone up for a pub crawl? As a footnote, those still mourning the loss of Agio may be interested to know that chef Joseph Heidenreich has relocated to Chef Joseph's at the Connoisseur Room. Triton Brewing Sprint Triathlon at Triton Brewing Company September 22, race starts at 4pm. Dugan Brothers Band will be playing the finish line. Tapping McQueenie’s Scotch Ale, September 26, 5pm. Come try Brewer Jon’s smoky, malty adventure into the Scotch Ale realms! Nacho Mama will be serving dinner. In 13 years, it's never happpened... But this is a new day! As you have for 13 years, come enjoy over 100 beers under our party tent or take your brew to the street. Shop our over-the-top silent auction, sing and dance to classic rock played by Saints & Strangers, and cruise on over to our fantastic food bar. 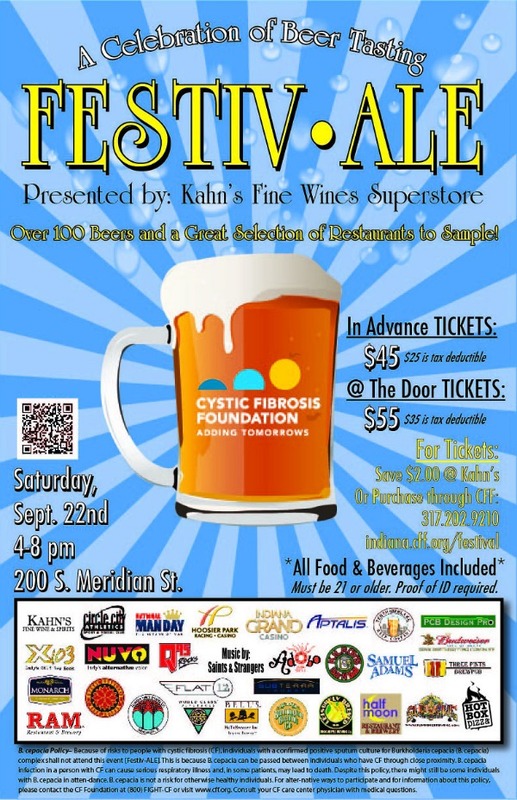 To purchase tickets, stop in any Kahn's location to save $2.00 or buy online at http://indiana.cff.org/festivale or call the CF office at1-800-622-4826. Yes, it's September, but we're almost back up to speed with the Beer and Cheese of the Month Club! We hear something extra rewarding is in store for September. That doesn't mean that August isn't something incredible on its own. Barleywine and blue cheese is a classic beer and cheese pairing, but we've taken that idea and went a little out into left field for August. Rochefort 10 is an amazing Trappist beer. If you don't believe me, go look it up on Beer Advocate or Rate Beer, I'll wait. Now that the internet has convinced you, it's time to try it for yourself. 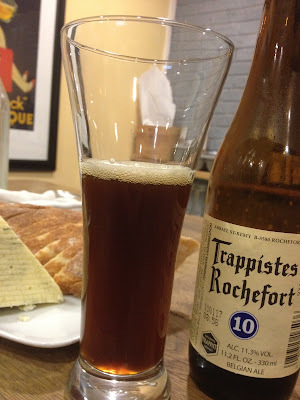 Rochefort 10 is the quintessential Belgian Strong Ale. The label says 11.3% ABV, but this beer hides its strength through layers of delicious dark fruit and malt. It's a good thing this comes in a 330 mL bottle or else we'd all be on the floor! Rogue Creamery may come from Oregon, but it's actually of no relation to Rogue brewery. Perhaps to confuse matters even more, Rogue brewery features Rogue Creamery cheeses in each of their public houses! 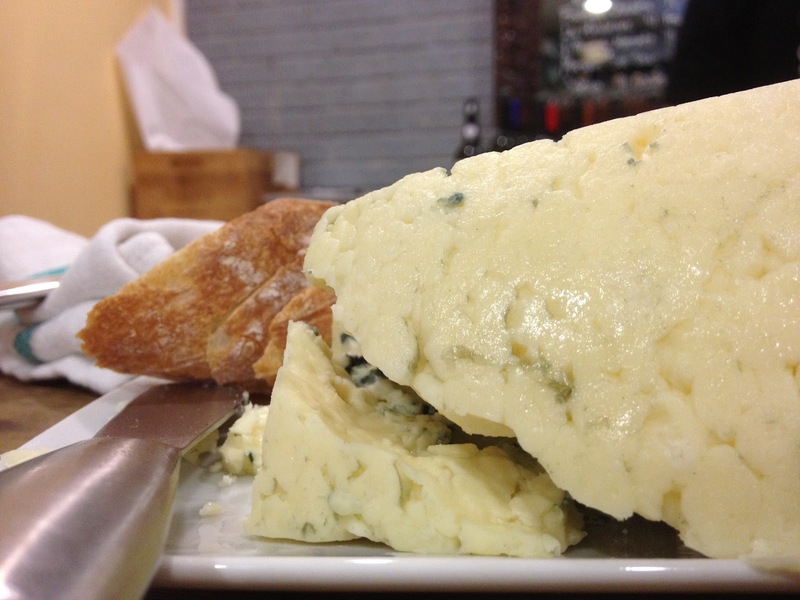 Regardless of the confusion, Rogue Creamery can claim its own notoriety in the cheese world through a variety of incredible cheeses. The Oregon Blue may be one of their go-to standards, but it's also one of the best examples of the style out there. We think you'll agree. If you're a member of the Beer and Cheese Club at Goose the Market, your August installment was ready for you to pick up a few weeks ago, so we hope you already have! If you're not a member, the club is $99 for 4 months. 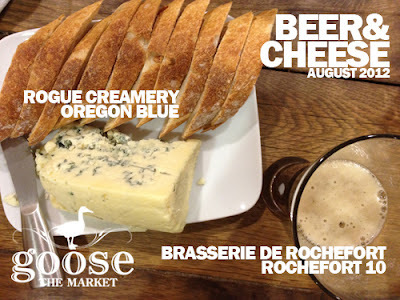 This month's delivery includes 2 bottles of Rochefort 10 and about 3/4 lb of Rogue Oregon Blue. Either of these items would be great experiences on their own, but we feel they are even better when consumed together. This was my favorite pairing we have done yet. 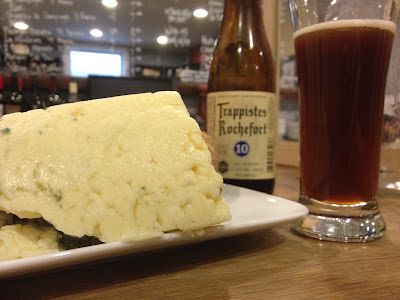 I already enjoy the flavors of good blue cheese, and Rochefort 10 is one of the best examples of a Belgian Quad you are going to find that is easily available here in Indiana. I also try each of items by themselves before trying them paired together. 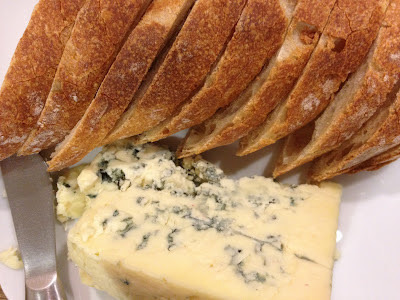 I started with the Rogue Oregon Blue and was greeted with one of the best blue cheeses I've personally tasted. It was meaty, sweet, salty, and creamy. The flavors continually evolved and changed on the palate. When you put the beer and the cheese together you really created something special. The dark fruit flavors in the quad really popped with huge dark fruit flavors of fig, raisins, and burnt sugar. All of the flavors in the blue cheese were elevated to another level as well. Those same flavors really came through with attention and taste bud grabbing nuances that challenged the palate, but kept you wanting more. This month's pairing is real treat. We found out that August was going to be Rogue's Oregon Blue and immediately we went to work on barleywines. Then we stopped and thought barleywines were too obvious. So naturally our minds went to strong ales. When we found out that we could obtain Rochefort 10 for this month, it was a no-brainer. Rochefort 10 offers up a nose full of dark fruit, cranberries, hazelnut and caramel. It is immediately apparent that this is going to be a rich and complex beer. The flavor profile of the beer is definitive of the style with tons of figs, raisins and cherries immediately present. The malt is rounded out by caramel, almond and muscavado sugars, leaving only a hint of alcohol behind. Now with the cheese, this beer is simply elevated to another level. The funky blue cheese is played down by the beer, but instead of mellowing they simply become engrossed in the dark fruits. The dark fruit elements become sweeter, which plays to the blue cheese flavor profile excellently. Both grow and become more complex, but neither overshadows the other. This is what pairing beer and cheese is all about. 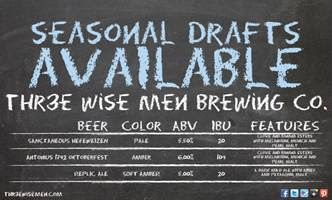 Thr3e Wise Men is now offering a great seasonal lineup! We have our Antonius 1742 Oktoberfest, Sanctaneous Hefeweizen & Replic Ale. Join us on Tuesday’s and get a pint of one of these great beers for only $2!! Clustertruck at Triton Brewing September 19, 5-9pm join 7-8 of your favorite food trucks for our 4th #Clustertruck event at Triton Brewing Company. Goose the Market in Indianapolis, Indiana, is accepting applications for Manager and Assistant Manager. This full-service butcher shop works with local, domestic, and foreign producers to stock handcrafted foodstuffs including charcuterie, cheese, dry goods, beer, wine, and, of course, fresh meats. Offerings also include ready-to-eat sandwiches, gelato, coffee, small plates, and wine and beer by the glass. The team staffing the shop is passionate about great food and good people, and sharing this passion means providing exceptional front-line customer service. The Manager is responsible for directing and executing the overall vision for the shop including managing people, products, and operations. People in the shop include staff and guests. The Manager is responsible for the staff's schedule, training, continued education, and overall performance. Because premier customer service is key to Goose the Market's success, the Manager is also responsible for ensuring that people visiting the shop have a superior experience. Products in the shop include a quickly rotating selection of prime foodstuffs. The Manager is responsible for stocking shelves and racks with products that represent the best in good, clean, and fair production. This means working directly with producers and importers near and far in person, in writing, and over the phone. The task also requires responding to customer requests and staff suggestions, maintaining up-to-date knowledge of potential new products and their availability, analyzing budgets for cost and profitability, and training staff on new products. Operations provided by Goose the Market encompass services to the public (like custom butchering, assistance in menu planning. executing pre-orders, and much more) as well as the general working operations that keep the shop moving. Since the Manager is responsible for all these operations, the Manager must have hands-on experience in all aspects of the shop's operations which can range from making sandwiches and washing dishes to managing 500+ Thanksgiving turkey orders to structural upkeep and equipment maintenance. Besides these physical operations, the Manager is also responsible for financial operations including budgeting and POS systems. The Manager should have at least 1-2 years professional experience working with budgets and fulfilling managerial duties. A passion for good food and drink is required along with strong interpersonal and communication skills. The Manager can expect to work with an Assistant Manager in executing some aspects of the position (including routine product ordering, staff management during individual shifts, and every day operations) as well as working with the owners of Goose the Market in developing and acting out the overall progression of the business. This salaried position involves about 50 hours per week on average. Applicants for the Manager position should submit cover letter, resume and/or CV, and salary requirements to jobs@goosethemarket.com or by mail or in person at 2503 N. Delaware St. Indianapolis IN 46205. Applications should be submitted AS SOON AS POSSIBLE, in anticipation of starting work no later than October 15, 2012. Goose the Market is also accepting applications for Assistant Manager. While assisting the Manager in executing the overall vision for the shop including managing people, products, and operations (as described above), the Assistant Manager is responsible for everyday operations which include hands-on leadership of the shop's butchering routine in addition to custom cuts for special orders. Routine ordering, directing staff during individual shifts, setting and executing menus for sandwiches and small plates, managing product rotation, and providing exceptional front-line customer service, and training staff are also part of the Assistant Manager's responsibilities. This salaried position involves about 50 hours per week on average. Applicants for the Assistant Manager position should submit cover letter, resume and/or CV, and salary requirements tojobs@goosethemarket.com or by mail or in person at 2503 N. Delaware St. Indianapolis IN 46205. Applications should be submitted AS SOON AS POSSIBLE, in anticipation of starting work no later than October 15, 2012. We will be hosting Tuesday Night Trivia with People's Brewery out of Lafayette this week. We always enjoy there beer and will be having Hop Killa on tap to help make any beer lover a happy drinker. 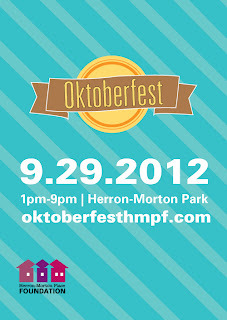 3rd Thursday will be taking place on September 20th 2012 with Bier Brewery. 5 courses paired with 5 beers will all be for $30. Corbin will be joining us to describe the styles, ingredients used, and the thought process the brewers have when designing certain styles. Scotty’s Brewhouse 96th Street Indianapolis is now pouring Sam Adams Griffins Bow!! You can enjoy a pint of this tasty beer everday of the week for $7! Scotty’s Lakehouse is now offering Flat 12 Upside Down Blonde! Come on by on a Wednesday and get a 48oz pitcher for only $10!